The Alsisar Haveli in located in the heart of the Jaipur city. The history of this haveli dates back to the 18th century. It highlights the splendor of old Rajput days and the regal of rajasthani experience for the guests. This beautiful Haveli was built in the year 1862 and has a large elevated platform that dominates the central area of the ground floor, which was once used for get-together by the gentlemen of the house and now used for hosting puppet shows and folk dances for guests. Alsisar Haveli, one of the rich heritage of shekhawati region, is als known as Asisar Mahal. Now the haveli is converted to a luxurious hotel. Extreme care was taken while refurbishing so as to maintain the original glory of the place. The magnificent architecture of the haveli and splendidly decorated interiors are as unique and captivating as its history. The walls of this haveli incorporate traditional wall painting with the use of vivid colours and patterns. All the rooms of this luxurious hotel have been given the look that were used by the Thakurs of Alsisar. Antique furniture and medieval Rajasthani style-fabrics that charmingly enhance the Rajasthani experience. 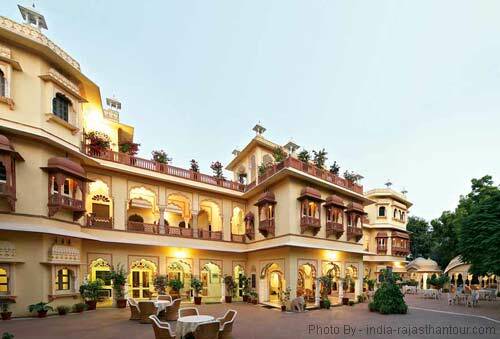 The historic Alsisar Haveli in Jaipur offers 45 well furnished heritage style state of the art rooms which are fitted with all the modern amenities and facilities. All the rooms have a feeling of royal luxury which the Maharajas of Jaipur used to have. Antique furniture, intricately carved poster beds, and medieval delicate motifs on fabrics, charmingly enhance the royal Rajasthani experience and recreate a flavor of luxury living for our guests. Tourists visit Jaipur can easily reach Alsisar Haveli by taking any private taxi or car as is only about 12 kms away from Jaipur Airport, 2 kms from Jaipur railway station and just only a km away from Jaipur bus stand.